If enthusiasm and optimism were guarantees for success, downtown Mesa would be a rockin’ place 24 hours a day. But, it takes more than enthusiasm to ensure that businesses will prosper and people will want to hang out and spend money in a particular neighborhood. A new group of business owners has found downtown Mesa and joined with longtime downtown staples in efforts to rebuild the downtown corridor. Many of the new Main Street business owners are young and have opened shops that some people wouldn’t consider typical for a historic downtown. That list includes a brewery, a vaping lounge and e-juice manufacturer, a vegan restaurant, a toy bodega, a creative, cooperative shared maker space, a record store and a comic book store. 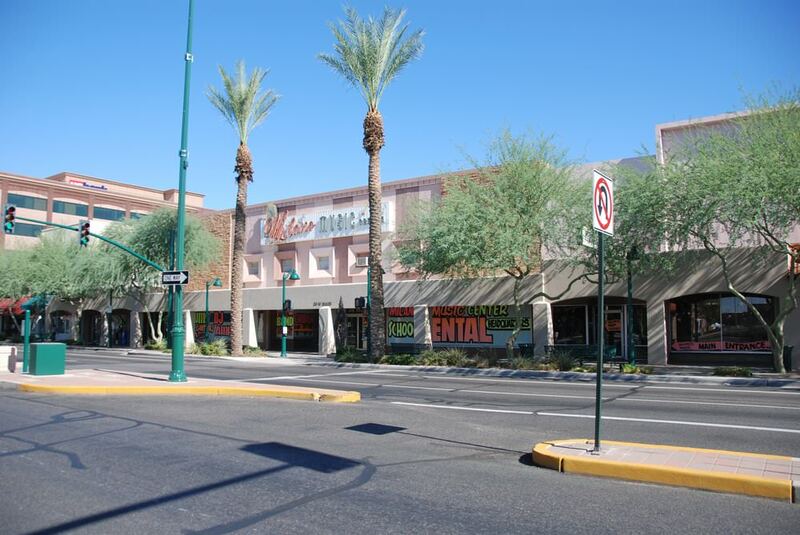 Much of downtown Mesa’s offerings are exactly what people would expect, a pizza restaurant, a fancier Italian restaurant, Mexican restaurants, clothing stores, a screen printing shop, banks, fast food outlets, antique stores, a music instrument store, several locally owned coffee shops, speciality bakeries, a shoe repair shop, ice cream stores and jewelry stores. Downtown Mesa has seen its share of ups and downs. For decades, especially in the 1950s, ’60s and ’70s, it was a thriving, full business district. Then malls became popular, and the city began spreading outward where more and more shopping districts popped up. Oddly, downtown Mesa business owner Gladys Contreras points out, now some malls are trying to re-create the look of a downtown. “So, I guess that means downtowns do work,” Contreras said. The business owners receive plenty of support from the city, the Downtown Mesa Association, Visit Mesa and the chamber, Contreras and fellow Main Street business owner Gary Brown said. In fact, the Mesa City Council has adopted a plan to continue boosting the downtown, Councilman Chris Glover said. Glover’s district includes downtown Mesa. It’s a wide-ranging mission statement of sorts with key priorities. The list includes offering more entertainment and events and a renewed focus to recruit more restaurants and nightlife options to downtown. The city is also pressing for the addition of residences to the downtown. Places to live, coupled with the longer light rail line that opened last summer in Mesa and another 2-mile stretch of rail, which gets under way this fall, means more people around at more times of the day, Glover and Mesa Vice Mayor Dennis Kavanaugh said. With more people around all day and night, the city can play up the arts community “to develop a younger, hip arts culture and vibe downtown,” Glover said. The two councilmen and Mayor John Giles said one of downtown Mesa’s obstacles is its size. Mesa’s Main Street is long, the mayor says, stretching 5 miles. It’s nowhere close to as condensed a downtown as Chandler, Gilbert and Tempe have. Because of that, Giles favors splitting Main into districts of sorts, with stretches dedicated to specific types of businesses. The focus to develop the next mile, beyond the arts and cultural district that exists between Mesa Drive and Country Club and University and Broadway, has already begun, Contreras said. Admittedly, downtown Mesa doesn’t have as many high-rise office buildings as other Valley downtowns, Kavanaugh said, but that’s not a particular worry for him. During the day, downtown is pretty busy, he says; it’s evening when the downtown gets too quiet. That’s why he’s a proponent of creating more residential units downtown and getting a grocery store to open. “That’s when we’ll know we’ve made it, when we get a grocery store,” Contreras said. Having the arts center and museums downtown is a plus for Mesa, Kavanaugh said, and all the groups focusing on a downtown revitalization play those amenities up. Kavanaugh, Contreras and Giles said the growth at Benedictine University and the planned downtown campus for Arizona State University will boost the downtown nightlife and spur housing options. “Maybe the universities and colleges will get creative and collaborate on housing,” Kavanaugh said. There’s plenty of room for housing downtown, Kavanaugh said, and at least some of it likely will be high-rises because of the proven success of such development near light-rail lines in the rest of the Valley. Contreras would like to see early housing projects be “affordable” and then let downtown housing options grow. The effects of light rail’s extension into the heart of downtown Mesa is a recurring topic in all conversations about downtown. Giles and Glover agree that the opening of the Mesa Arts Center a decade ago spearheaded a resurgence in the city’s downtown. Now, with light rail stopping in front of the arts center, more people have better options for getting to events there, the mayor said. The numbers show that people are coming to downtown Mesa, Giles said. Valley Metro ridership data shows that since light rail opened last August, ridership into the downtown has doubled, to 180,000 people a month. Brown, the owner of Surf and Ski, is happy to have the light rail downtown, but would prefer the line not be on Main Street because it resulted in fewer traffic lanes for autos. “It’s a good thing, and I hope it continues to bring people downtown and maybe to restaurants, especially near the Mesa Arts Center,” he said. Brown doesn’t get many customers who’ve ridden downtown on the train, but he knows other businesses do. Likewise, most of the special events staged downtown haven’t brought customers to Surf and Ski, but again, Brown knows they help other business owners. Giles said city officials are “heavily invested” in bringing things downtown. The city is the sole provider of utility services downtown and can use that as a recruitment tool, he said. The city also owns a lot of downtown property and can work with developers on future projects. For example, Kavanaugh said, the city recently installed fire sprinkler lines in alleys behind buildings, which means more types of businesses can operate in more spots. Depending on the business type, such sprinkler lines can be mandated. One key factor that started the trend toward some of the new types of businesses choosing to open downtown, Glover and Kavanaugh said, was the creation of the entertainment district. It was precipitated by a law change by the Arizona Legislature, Kavanaugh said. It loosened restrictions on where businesses that serve alcohol could be located, which is encouraging nightlife and vibrancy, Glover said. Michelle Donovan, owner of the Nile Theater, is one of those business owners who benefited from the change. Last July, the Nile obtained a liquor license, which resulted in a shift for the business, Donovan said. Getting that license wasn’t easy, she said, because an injunction was in place prohibiting the sale of alcohol at the site because of decades-old issues with alcohol at the Nile. She knew about the injunction and knew there’d be obstacles to overcome, but Donovan pursued the license because she wanted to be able to serve alcohol when the light rail started bringing in more customers. She credited the Downtown Mesa Association, Neighborhood Economic Development Corporation and Mayor Giles for getting the license. The Nile Theater has been a music venue since she opened in 2010, Donovan said. It features all music genres, Donovan said, including a lot of local bands which play in The Underground, located in the theater’s basement. It’s an all-ages venue, but kids younger than 12 need to be with a parent. After choosing downtown Mesa as the site for their business, they were pleasantly surprised to find that it took just a week to get a business license and certificate of occupancy from the city in order to open. Of course, the liquor license took longer. Everyone seems to agree that downtown Mesa can’t be transformed overnight or even in a year or two. “We’ll continue to make downtown a place we’re proud of,” Giles said. Brown is one of a handful of downtown business owners who has witnessed the multiple reinventions of downtown Mesa. Brown has owned Surf and Ski since 1968. He’s moved the screen printing store a few times within a three-block area but has been at 137 W. Main St. since 1992. He also owned and operated a few other downtown business during the decades. But his karaoke shop and discount clothing store have closed, mostly because of business slow downs. Downtown Mesa used to be “the place” for shopping, Brown said. But then malls starting opening farther away from the city’s center and businesses either moved to them or closed. On a recent weekday, he went outside at 2 p.m. to look for pedestrian traffic downtown and said he saw none. Downtown Mesa may have struggled, Brown said, but it never died, mostly because it’s not a cookie-cutter business district, and he said it needs to stay that way. While cautiously optimistic may describe Brown’s current attitude toward the downtown’s future, he has one big concern — that the city’s sign ordinances hurt businesses. Signs can’t be lit or feature neon, and he thinks that results in a dark downtown at night. But, he’s a fan of Mayor Giles and Sally Harrison, president and CEO of the Mesa Chamber of Commerce. Those two and the Downtown Mesa Association “want to revitalize downtown and bring people down,” Brown said. Contreras, of Nebula Vaping, agrees, noting that it’s not the case in all cities that government officials care as much for their downtown as they do in Mesa. Contreras appreciates the support her business has received from the city, most recently in the form of a community development block grant that’s allowing them to hire employees and buy supplies to meet a huge, recurring manufacturing order. While Brown may have ended up in downtown Mesa because at the time he started his business, that was “the place” to be, Contreras and her brother, Francisco, chose downtown Mesa because all the other cities in the Valley “already knew who they were,” Gladys said. And, Mesa is still creating its identity. Nebula Vaping is a an electronic cigarette and e-juice manufacturing business. The siblings manufacture the modules used as e-cigs, make the juice that goes in a module and offer a vaping lounge for customers. Their products are sold across the globe. Coming from a family with real estate backgrounds, she knew to never buy the most expensive house on the block, but find a good entry-level rent, which they did in downtown Mesa. The Contrerases operated Nebula Vaping on Macdonald Street for a year before moving to Main Street about a year and a half ago. She doubts they could have immediately opened on Main Street, because of attitudes and a lack of understanding of vaping businesses. Coincidentally, Brown opened Surf and Ski on Macdonald, but moved when the street was widened and he lost part of his building. Contreras is appreciative that she and her brother “were fortunate to find a young, progressive landlord looking toward the Next Mesa,” a theme adopted by Giles and other city leaders. Donovan, owner of the Nile, also leases the building next door to the theater where she and Felina Ivey own and operate Volstead Public House, a vegan restaurant with vegetarian options. That business opened the same day the extended light rail route began operating downtown last August. The restaurant serves multiple purposes, Donovan said. First, it makes sense to control the other side of a building where loud music gets played to avoid possible hassles with another business owner. Secondly, it offers a non-typical menu for people who want dining options. It had to be vegan, she said, because the owners are vegans and felt obligated to serve the kind of food they eat. Like many other Main Street business owners, Donovan works through social media to help dispel the perception that there’s nothing in downtown Mesa. Overall, she’s found plenty of support from other downtown merchants, and she knows some of her customers spend money in other stores, and vice versa. While Nebula Vaping may be a nontraditional business, “we are homeys,” Contreras said. The Contrerases tout all the other downtown businesses to their customers and know other business owners do the same for them. “Who better to be ambassadors for downtown than those of us with stores here?” Contreras asked. She estimated that a shopper in downtown Mesa stands a 75 to 80 percent chance of meeting the shop owner when they visit the store. Contreras is proud to be a local owner of a unique, local business, and she’s hopeful more such businesses will open in downtown Mesa. “If people take the time to walk through here, they’ll fall in love with it and that doesn’t happen everywhere,” Contreras said of downtown Mesa. • Contact writer: 480-898-6533 or sridenour@evtrib.com. • Check us out and like the East Valley Tribune on Facebook and EVTNow on Twitter.